Epiphytic plant with flexible roots, glabrous. Stem short, compact, completely enclosed by imbricating leaf-sheaths. Leaves fleshy, leathery, elliptic or obovate or oblong-elliptic, acute or obtuse, at conduplicate base, long of more than 25 cm, broad of at least 12 cm. Flower stalk robust, sub-erect or arcuate, with the rachis in zigzag, few flowered. Bracts ovate, cucullate, acute, of 7 mm. 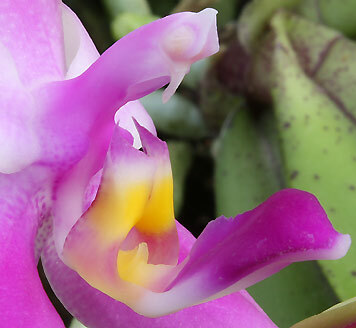 Flower fleshy, waxy, being able to reach 6 cm, often smaller. Sepal dorsal oblong-elliptic or elliptic or ovate, or ovate-lanceolate, somewhat concave, prominently carinate dorsally. Lateral sepals obliquely adnate to base of column, ovate-lanceolate, sub-sickle-shaped above, with conduplicate apex and well marked dorsal keel. Petals elliptic or ovate-elliptic, at asymmetrical base, rather acute. Lip 3-lobed. Lateral lobes erect, linear-oblong, at truncated apex and with a callus in shape of half moon in their middle. Midlobe ovate, apiculate, fleshy, convex, with a median membranous keel ending in an ovoid callus right before the apex, completely glabrous, sometime provided of few warts on the apical callus. Disc between lateral lobes, pulvinately incrassate, papillous in front, merging into 1 to 3 superimposed, often divided, fleshy lamellae. At the junction of the three lobes one finds an appendix bifide, fleshy, deeply grooved in his middle. Column fleshy, slightly arcuate, cylindrical, widened towards his base, of more than 15 mm long. Pedicellate ovary of 3 cm, pod being able to reach 15 cm. Flowering is possible all over the year, but is more abundant from spring to autumn. The flowers emit a strong perfume comparable with that of certain water lilies, Freesia or bergamot. The color is very variable. One finds incarnat, mauve, magenta, magenta pink, carmine pink on the floral segments. The end of sepals and petals is normally green. The midlobe and the column are pink/carmin or magenta. The flowers with the most uniform color are of Malaysia. Those of Borneo are contrasted. Sepals and petals are white or ivory with a suffusion of green. The 1/3 superior is of a green apple and a magenta spot of variable size decorates the lower part of the lateral sepals. 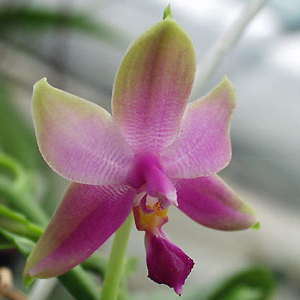 The true name is now Phalaenopsis bellina. 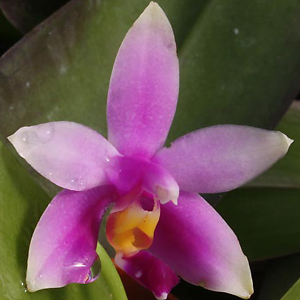 Leaves can reach more than 50 cm.long (Phalaenopsis bellina) and made it confuse by collectors with Phalaenopsis gigantea. Phalaenopsis violacea grow sometimes with Phalaenopsis sumatrana. Very used for hybridization, this species is more volontier used like seed-bearer than as supplier of pollen. 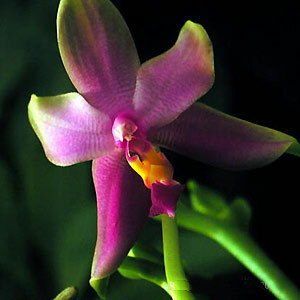 Phalaenopsis violacea is a plant of hot and wet climate. It is originating in low grounds with a relative humidity around 80% with a light intensity permanently limited to 10.000 luxes. One very often finds it on mangrove. Practically disappeared from the cultures in 1960, he knows since a renewed interest. Discovered first of all in Sumatra by Teijsmann which, in 1859, sent some specimens to the botanical garden of Leyde or Witte made it flower for the first time in Europe (volume 4, page 129 of Annals of Horticulture and Botany or Flora of the Gardens of the Kingdom of the Netherlands). In 1862, Willink of Amsterdam made flower a second specimen. 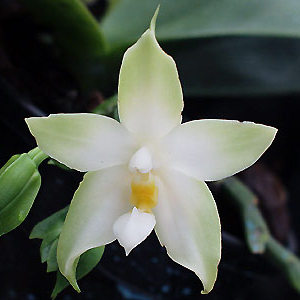 Phalaenopsis violacea var.alba (Teijs. & Binn. 1862) or Phalaenopsis violacea var.albescens. White sepals and petals with more or less green tips. Sepals and petals clear yellow with a broad magenta spot inside the lateral sepals and some fine bands accompanied by some points of the same color at the base of the petals and dorsal sepal. Sepals and petals lemon-yellow, with magenta spots on half interns lateral sepals. Midlobe and column magenta. lateral lobes orange/yellow at tips. Sepals and petals white with the 1/3 superior greenish yellow. Instead of the broad usual spots on the lateral sepals one finds many spots. 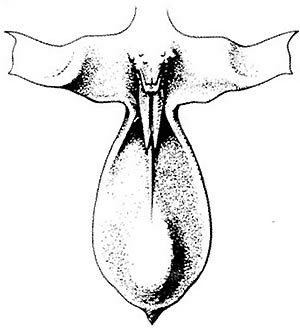 The apical part of the midlobe, the base of the column and anther are red purplished. The lateral lobes and the edge of the midlobe are pale yellow.